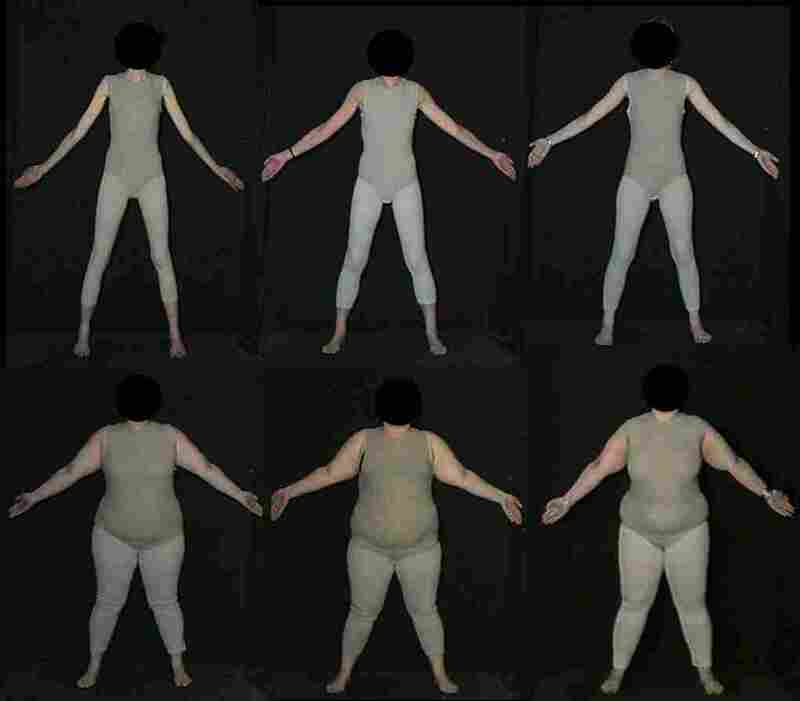 How Changing Visual Cues Can Affect Attitudes About Weight : Shots - Health News To change negative attitudes about body size, simply reframing what people see might help. Women in England became more tolerant of overweight people when they were shown more photos of plus-sized women in neutral leotards. Pictures like these helped British researchers gauge people's attitudes about weight. With most Americans fat or fatter, you'd think we'd be lightening up on the anti-fat attitudes. Alas, no. Even doctors often think their overweight patients are weak-willed. But changing negative attitudes about body size might be as simple as changing what you see. When women in England were shown photos of plus-sized women in neutral gray leotards, they became more tolerant. When the women were shown photos of anorexic women, attitudes became more positive there, too. "Showing them thin bodies makes them like thin bodies, more, and showing them fat bodies makes them like fat bodies more," says Lynda Boothroyd, a psychology researcher at Durham University in England, who led the study. She calls it a "visual diet," changing what your eyes eat. Why the unflattering leotards? Boothroyd and her colleagues wanted neutral clothing to sever the link between thinness and success that's so strong in Western cultures. The researchers also tested photos of women in designer clothes and found the test subjects thought better of the well-dressed women, fat or thin. The glamour effect existed independent of the change in perception caused by repeatedly seeing the leotard-clad women. All the study participants still preferred thinner-than-average bodies, but their preferences did move up or down depending on what they saw. Perhaps that's why we're so obsessed with thinness, even if most of the people around us are found to be larger. We're constantly fed images of very slim actresses and models, all beautifully dressed. "All you have to do is watch five minutes of TV and you see more thin bodies than you would all day on the street," Boothroyd says. There's no question that culture affects not just attitudes about weight, but body size itself. When Zulu women move from South Africa to England, their body size preference shifted from the full figures favored in Africa to a midway point between that and the thin ideal in the UK, Boothroyd says. Her work is published in the current issue of the online journal PLOS One. But that shift clearly hasn't happened in doctors. Another study in the same issue of PLOS One found that doctors are strongly biased against fat people, even if they don't think they are. This comes from a fascinating crowdsourced study, Project Implicit, which is designed to tease out attitudes that people are unwilling or unable to articulate. Led by psychologist Brian Nosek, an associate professor at the University of Virginia, the project offers dozens of free online tests that let you test your implicit biases – and contribute to science, too. Participants are shown photos of faces, and are tested on their speed to identify them and associate them with positive and negative words. More than 359,000 people took the project's "Weight Implicit Association Test" online, and about 2,300 said they were doctors. Even though physicians are constantly reminded about their need to work with patients to maintain a healthy weight, they had the same strong anti-fat bias as the public. "We don't know if this affects how doctors behave clinically," says Janice Sabin, an assistant professor in bioinformatics and medical education that the University of Washington in Seattle, who led the new study. But other studies have shown that many doctors view obese patients as unattractive and difficult to work with, and that obese women get inappropriate comments about their weight from their doctor. Given that, maybe it's time to show doctors some plus-sized photos — of hefty physicians.